Let us start off with something that is really quite simple and yet is capable of producing a sense of real satisfaction when complete – a real mediumwave (MW) radio receiver! It proves that receivers can be simple and, at the same time, be useful and enjoyable to make. To minimise the confusion to absolute beginners, no circuit diagram is given, only the constructional details. The circuits will come later, when you have become accustomed to the building process. 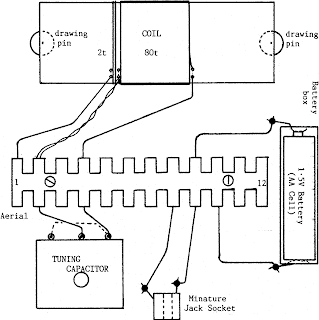 In the true amateur spirit of ingenuity and inventiveness, the circuit is built on a terminal strip, the coil is wound on a toilet roll tube (as amateur MW coils have been for 100 years! ), and thE receiver is mounted on a piece of wood. 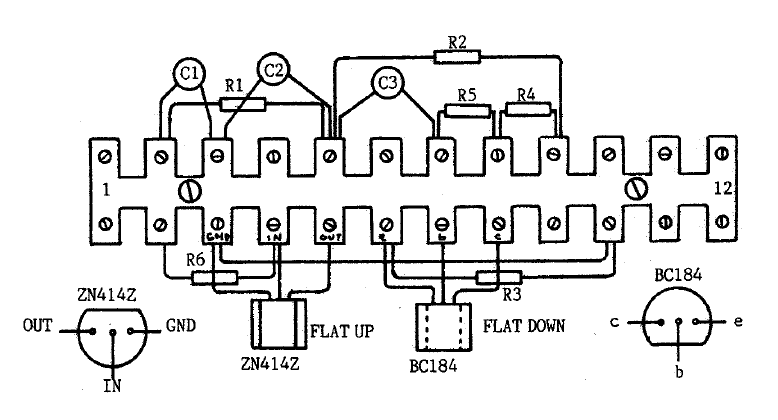 Start by mounting the components on the terminal strip as shown in Figure 1, carefully checking the position and value of each one. The three capacitors are all the same, and so present no problem. They (and the resistors) may be connected either way round, unlike the two semiconductors (see later). The resistors are coded by means of coloured bands. The integrated circuit (the ZN414Z) and the transistor (the BC184) must be connected correctly. Check Figure 1 carefully before fitting each device. Now wind the coil. Most tubes are about 42 mm diameter and 110mm long. Don’t worry if your tube is slightly different; it shouldn’t matter. Make two holes, about 3 mm apart, about 40 mm from one end, as shown in Figure 2. Loop your enamelled wire into one hole and out of the other, and draw about 100 mm through; loop this 100 mm through again, thus anchoring the wire firmly. Now wind on 80 turns, keeping the wire tight and the turns close together but not overlapping. After your 80th turn, make another two holes and anchor the wire in the same way as before. same two holes which contain the end anchor of the last winding, wind two turns and anchor the end of this short winding using another pair of holes. 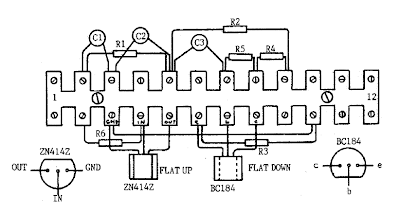 Figure 2 shows the layout. With some glass paper, remove the enamel from the ends of both pieces of wire which go through the same holes (i.e. the bottom of the large coil and the top of the small coil), then twist these bare ends together. Remove the enamel from the remaining ends of the coil. The coil is now finished! The baseboard can be any piece of wood about 150 mm square. 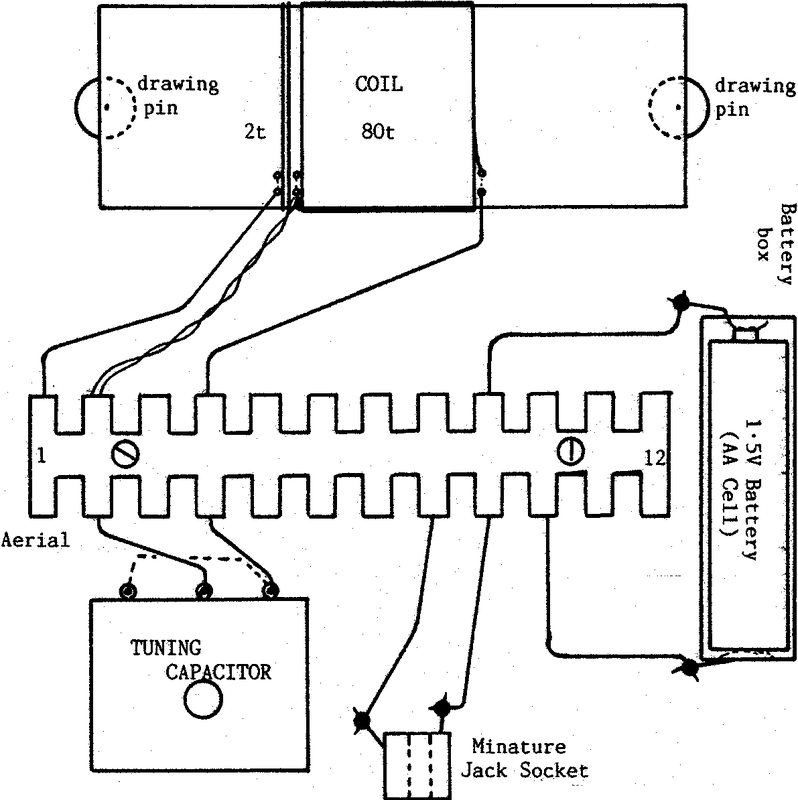 Fix the coil near the back edge using drawing pins and connect the wires from the coils to the terminal strip as shown in Figure 2. Using short pieces of PVCinsulated wire (and with assistance if you have never soldered before), solder one piece across the two outer tags of the variable capacitor, shown by the dotted line in Figure 2, and then two longer pieces to the centre tag and one outside tag. Connect these to the terminal strip. Then solder two more insulated wires on to the jack socket (into which you will plug your crystal earpiece), the other ends going to the terminal strip. The last two wires (one must be red) need to be soldered on to the battery box, their other ends going to the terminal strip also. Make sure the red wire goes to the positive terminal on the battery, and is connected to terminal 9. The other connection to the battery goes to terminal 10. Attach the terminal strip to the baseboard with small screws or double-sided sticky tape. The other parts can be mounted the same way. Listening is done ideally with the recommended crystal earpiece. Don’t be tempted to use your Walkman earpieces; they are not the same and will not perform anything like as well. The receiver should work without an extra aerial, but one can be attached to terminal 1 if necessary. A long piece of wire mounted as high as possible is ideal. The Audio-frequency Amplifier project will enable you to use a loudspeaker with your receiver, using the signal from the jack socket. No circuit modifications will be needed! Like many other Web sites, http://basicelectronicprojectstutorials.blogspot.com/ makes use of log files. The information inside the log files includes internet protocol ( IP ) addresses, type of browser, Internet Service Provider ( ISP ), date/time stamp, referring/exit pages, and number of clicks to analyze trends, administer the site, track user’s movement around the site, and gather demographic information. IP addresses, and other such information are not linked to any information that is personally identifiable.
.:: Google's use of the DART cookie enables it to serve ads to users based on their visit to http://basicelectronicprojectstutorials.blogspot.com/ and other sites on the Internet. http://basicelectronicprojectstutorials.blogspot.com/ has no access to or control over these cookies that are used by third-party advertisers.